This is what fighting the giant scorpion tank guarding the Sector 1 Mako Reactor at the beginning Final Fantasy VII will look like in the game’s remake. If it ever comes out that is. 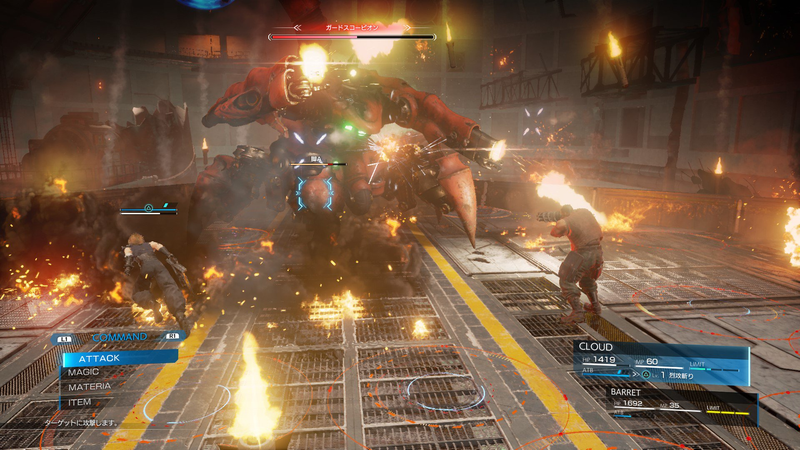 Tetsuya Nomura, the game’s director, revealed two new screenshots for the game at this year’s Magic Monaco 2017 event. The above image shows Cloud and Barret unloading on the security drone a firing clash of gun-arms and Buster swords. For a quick point of reference, here’s what the fight looked like in the original game. Interestingly, the new screenshots also offer a glimpse of the game’s battle interface, at least as it currently exists. I’m not sure why there’s a slot for both magic and Materia, or why Cloud and Barrett both have hit points north of a thousand. The HUD look’s simple and sleek enough, and hopefully it doesn’t fall into the same traps that snagged Final Fantasy XV. Beyond the two quick screenshots, Nomura had nothing else to offer, noting that while he had wanted to show an entire video at the event, that decision had been vetoed by his colleagues. Square Enix had nothing new to say about the game at the series 30th Anniversary Celebration either, instead just showing off some of the game’s new artwork. Nomura also offered a quick peak at Kingdom Hearts 3, a game that’s been in development for several years having first been revealed at E3 2013. Neither game has anything close to a release date yet.